One-Minute Summary: U.S. equities fell for the second week. This hasn't happened since last June and we would note that too was a quarter-end trade. We expect some recalibrations of portfolios. Small caps came under some pressure. They’re down 6% over the last month but still well up on the year. We also saw corrections in the Consumer Discretionary, Tech and Communication Services sectors. We’d put that entirely down to the new sectors that came into being a few weeks ago (we wrote about it here), where tech companies moved around and probably threw off sector allocations for managed and index funds. The market has faced some pressing issues recently. Trade talks, some hawkish Fed talk, Italian bond yields, QE tapering in Europe, oil. Take your pick. Caution is called for while we go through the next few months. 1. Jobs, less than expected but more than enough. The number was less than expected at 134,000. There are two surveys in the monthly employment numbers and the differences are important when bad weather strikes. One, the household survey (basically people answering a phone survey), which is taken the 12th of the month and counts anyone employed full time, even if they didn't work because of bad weather. Two, the establishment survey (businesses answering a questionnaire), which asks about average weekly hours and will record fewer hours if employees can't get to work. So, in the first, weather has no real impact on full time workers but does on part-time and in the second, the amount of work can change and throw off the trends. And that was the case with the September numbers. Florence hit between September 10 and 13, and so the official numbers would not have caught part timers who could not work because of the storm. Similarly, while the average hourly workweek did not change, it fell for high labor intensity industries like wholesaling and construction. Overtime hours also fell which you would expect if you can't get to work. All in all, the low headline number probably underestimates the strength of the labor market. Unemployment fell to a near 50-year low, annual wage growth fell a little on a base effect (it rose this time last year) and the broader measure of unemployment rose and is not close to its multi-year lows. The headline numbers are strong and won't dissuade the Fed from moving rates up again in December. We don't totally buy into the increase in earnings because a) it’s all employees and so is skewed by high-end earners and b) it's not inflation adjusted so doesn't really tell us if purchasing power is increasing (it's not). Which looks impressive until we dig in and see that a) slack is notoriously difficult to measure b) Cinflaiton (sic) is the tendency for inflation to linger, so also tough to measure and c) Other, is, well, “unspecified factors”. Clear? No, nor us. We're not there yet with increase wages and, to us, that relationship seems so very 1970s. But along with good numbers from the Manufacturing and Service Industry surveys (the latter at a record high), the 10-Year Treasury yield spiked from 3.08% to 3.23% for about a 1% capital decline. Some of this may be technical…weird stuff happens at quarter end...what with window dressing and rebalancing. The 2-Year Treasury only moved up 8bps and for the issue that we’ve been buying recently, the price fell $0.05 from $99.13. It seems one of two things must happen as rate hikes continue. 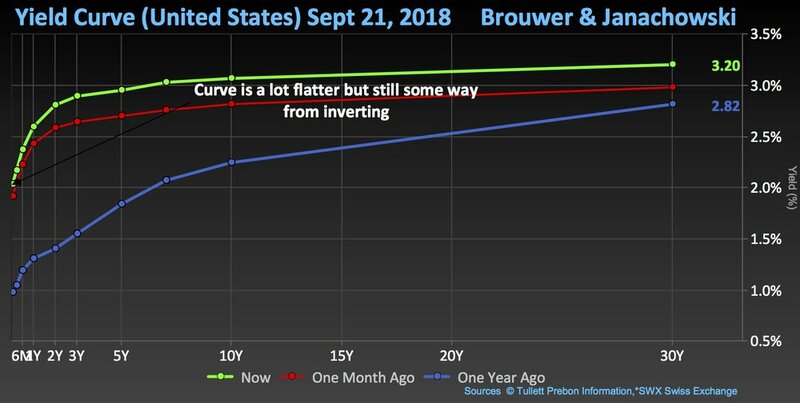 Either, the yield curve inverts, and that can be any part not just the popular 2s/10s, and the economy weakens. Or, the curve shifts upwards as growth and inflation take off. The market shifts between the two and last week the latter had the upper hand. The employment and ISM numbers supported the second version. The disappointing trade number (the deficit with China was at a record level…we’ll leave it at that), supports the first. It’s fallen in recent weeks. 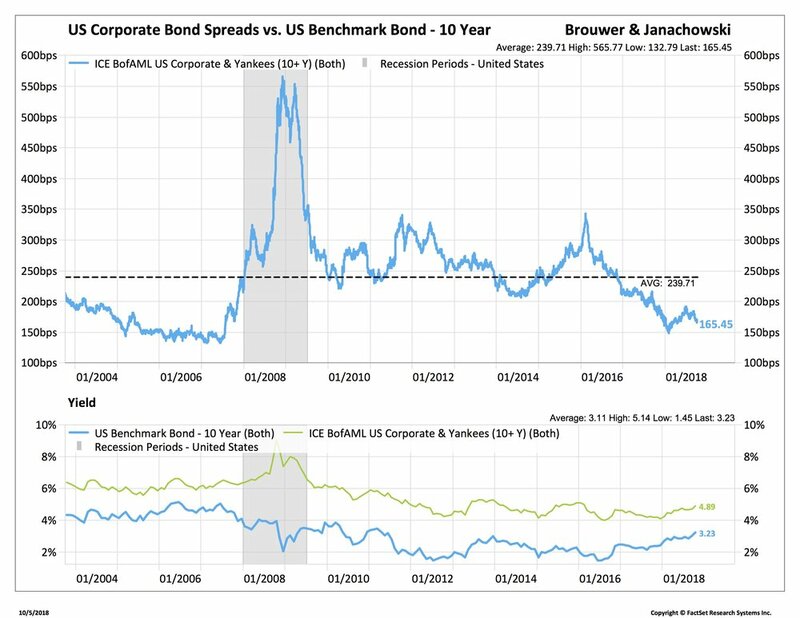 Now, call us cautious but it does not seem that U.S. corporate debt became less risky recently. It’s 90% industrial and financial companies and 50% of the index is BBB rated: one notch above junk. One thing we know about this cycle, is that companies have rushed to load up on debt at low rates. Normally, around 7% to 15% of companies are downgraded at the end of a cycle. Assume it will be at the top end of the range this time, then we’re looking at 15% of BBB bonds will be junk. And then ETFs and Funds will be forced sellers at the bottom. That’s not a good place to be and keeps us firmly overweighting short term Treasuries. Bottom Line: There is a collection of exacerbating factors driving capital markets right now. Most of these are known but sometimes the market stops, weighs them all up, takes some profits and rethinks it all. Nothing major happened but some traders are getting out of positions that didn't work last quarter. We'd continue to buy insurance for our long equity positions. China was closed all week so there may be some catch-up on Monday. The Days Ahead: Fed meets and will raise rates. One-Minute Summary: Stocks reached another record high. We're now up 10.1% for the year and up 15% since the mini correction in February. Small caps have done even better at 16.1% and 19%. We've seen stocks rotate. That's when stocks that were previously unloved come back in favor. We looked at sectors like Consumer Staples, one of the worst performing sectors, which was down 5% to the end of August but rallied 2.3% so far in September. Tech, the clear winner for most of this year, is down for September. It’s happening at the stock level, of course. Exxon, the sixth largest company in the S&P 500, was down 4% from January to August. It’s up 6% so far in September. It’s the same story with companies like Caterpillar, Altria, Cigna and some major insurance companies. What this tells us is that prior favorites like Tech and Small Cap are taking a breather or open to profit-taking and lagging companies are having their day. It doesn't change our Small Cap outlook…Tech is different, it’s under some regulatory pressure and much more expensive. Small Caps have a relatively high exposure to REITs, Financials and Specialty Retail…all of which have come under recent, temporary pressure. The dollar looks like it peaked a month ago. It was up 9% from February but has since weakened against some key currencies…down 4% against the Swiss Franc, 3.5% against the Euro, 2% against the Yen and 3% against sterling. Yes, the dollar has the rate advantage but exchange rates are also driven by confidence, diversification and capital flows. The U.S.’s twin deficits (current account and budget deficit) are heading the wrong way and eventually they’ll show up in the exchange rate. We don’t think anyone’s winning the trade war. Despite the big numbers from the Administration, the tariffs amount at worst, to $60bn, which is less than 0.3% of U.S. GDP and a drop in the bucket compared to the $220bn of tax cuts coming into the U.S. economy. Because so much of the imports from China are intermediate goods (here’s the list, it’s 195 pages), the costs may show up in higher prices or squeezed margins some months from now. But it won't be big and it won't solve the broader “Made in China 2025” problems. Also big news: the sector definitions for the S&P 500 will change on September 24. We’ll no longer have a tech sector at 28% of the index. Instead we’ll drop Telecom and have a new Communication Services group. It will bring in some companies which are now Consumer Discretionary, like Comcast and Netflix, and some which are now in Tech, like Google and Facebook and will be around 11% of the S&P 500. Expect some rebalancing trading on Monday. 1. “Tax Cuts will lead to pay increases”. Said some and indeed there was a 2.9% increase in hourly earnings (AHE) in the August payroll numbers. Hooray said some. Not so fast, said others. It’s only #3 that matters and the results are mixed. The tax cut was meant to lead to higher investment, productivity and wages. It was one of those “it pays for itself” programs. As we pointed out at the time, that was a big ask because the tax cuts caused the deficit to increase by 1% of GDP immediately and by another 1% over 10 years. 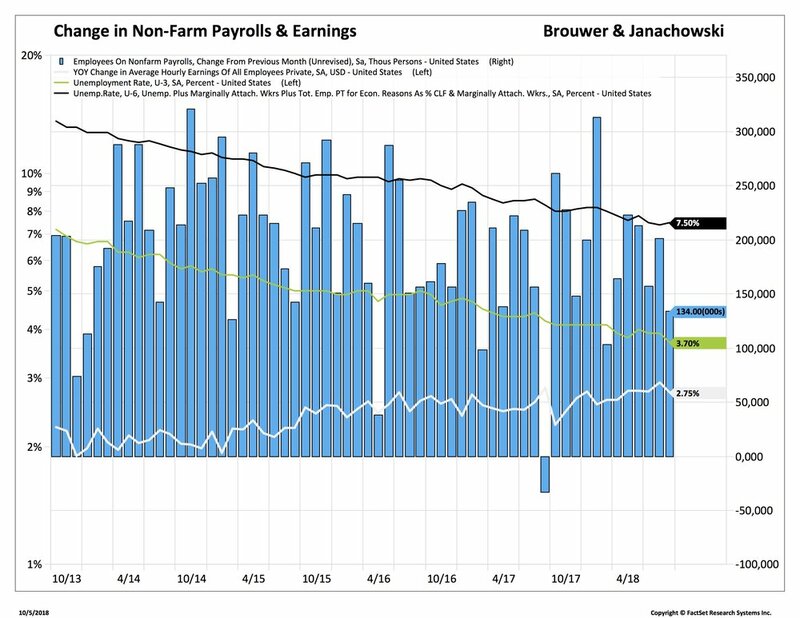 The blue bars are what’s reported in the payroll numbers with average hourly earnings up 2.9%. But if we deflate that by the CPI so get a picture of real purchasing power, we see a less impressive 0.23% (black line). And if we separate out the very large cohort of Non-Supervisory Employees from the All Employees category, we see the real hourly wage at $9.24, lower than a year ago. Now, we bring this up again because of headlines like “U.S. wages grow at fastest pace in nine years” (Financial Times) and “Bumper Wage Growth”. Hey, we’d like nothing more. The U.S. consumer drives 70% of GDP, perhaps more than any other economy in the world. But it’s not showing up in things like retail sales or housing and it’s very likely personal consumption will grow a lot less than the 3.8% it showed in Q2. 2. So, 3% on the 10-Year Treasury. Now what? Probably not much. There are some seasonal aspects to the Treasury market. They have to do with when new auctions come around, corporate cash needs, repatriation and even national holidays in China and Japan. This year, U.S. companies with pension deficits could deduct the cost of funding them using the old 2017 corporate tax rate up until September 15. That meant a CFO could save some 15% on buying Treasuries. We feel that kept the 10-Year Treasury under 3% for most of August. That buying has now stopped. We're not sure if the move to inversion (i.e. the upper blue line falls to below zero) is a solid indicator of a recession. Sure, looking back over 30 years, there it is…the spread falls to below zero and a recession appears some 14 to 26 months later. So that’s three times in 30 years. But here’s the thing: being early and right is the same as being wrong. There is no point heading to the long part of the curve in the expectation that all the price weakness will be at the short end. And as for coming out of equities, well, we’re not timers and markets can have strong and late rallies for quite some time. Here’s the curve shown in stark terms…compare the yellow line to the shape of the curve a month and year ago. 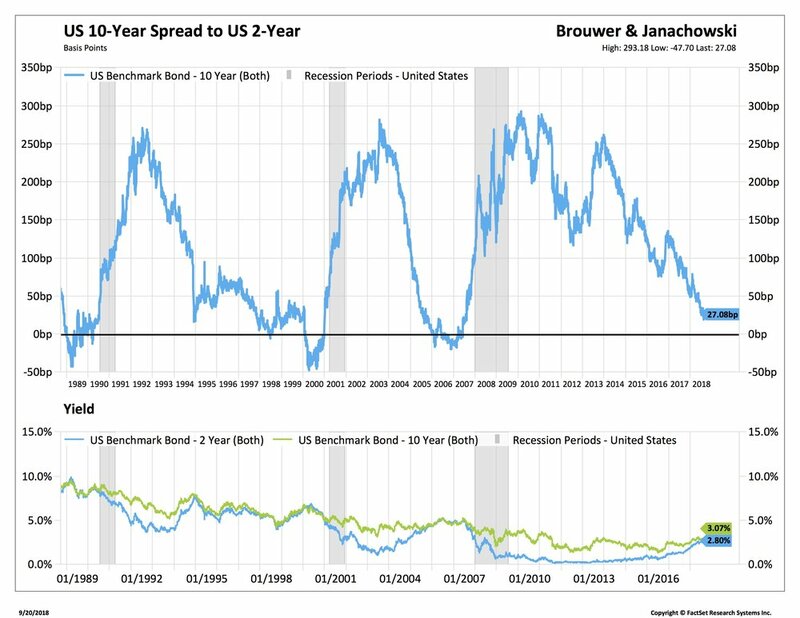 It’s only the 2 to 10-Year Treasury spread which is flattening. 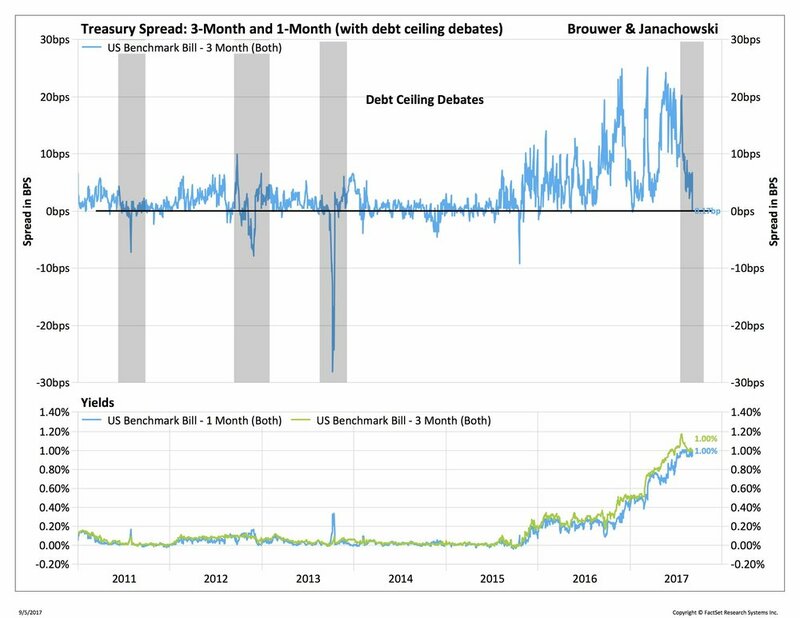 We'd argue years of QE and low absolute and real rates mean that any inversion will have to look at 3-month bills and long-term bonds. And we’re not close there. All we did here was look at several U.S. Treasury prices today and work out how much rates would have to rise in order to lose money on a Treasury trade over 2, 5, 10 and 30 years. The duration measures how much the price of the bond would fall if rates increase 1%. The best risk/reward right now looks like the 2-Year Treasury (actually it’s about 19 months, maturing in April 2020). It yields 2.38% for a risk/reward of 0.56. Another way to look at that is that rates would have to rise 1.7% immediately for that investment not to have a positive return. For a 30-Year Treasury, rates would only have to rise 0.16%. To be clear, we’re not ringing any alarm bells here. We're just taking advantage of the recent rise in yields, which makes a short-term Treasury investment look quite attractive and, for the first time in a while, a valid asset class. 3. Any relief on Emerging Markets yet? Some. Performance in 2017, when Emerging Markets were up 45%, seems distant. So far in 2018, we’re down 8% but up 4% from the bottoms just two weeks ago. We've discussed before what’s happened (basically a dollar, interest rate and trade problem) but the question now, of course, is what next? Here are some quick thoughts. Buying into Emerging Markets is not an exchange rate or trade story. It’s about growth, demography and expanding economies. Turkey and Argentina are basket cases. They're not in the Emerging Markets asset class to any meaningful weight but their stories grab headlines. We don't believe the financial contagion story for a moment but agree there’s a sentiment problem. Drawdowns in Emerging Markets are common. 50% of global growth comes from Emerging Markets. The new NAFTA with Mexico is good for Mexico. The 22% annual increase in oil prices has hurt Emerging Markets but the supply issues (Iran and Venezuela) are no longer driving up prices. Seasonal patterns happen in Emerging Markets especially after a bumper year like 2017. China stocks had their best day in two years on Friday…these things move fast. So while the short-term can stretch patience, the longer-term strategic case remains. Bottom Line: Fed meeting. Much will depend on whether the Fed removes the “accommodative” wording. They’ll also review the long-term projections for the Fed Funds rate. It’s currently at 2.3% to 3.5%. If that heads up by 0.5% we may see some pressure on bonds. The Days Ahead: Trade and more trade. Unemployment numbers. 1. Trade Talks. China, Canada and Europe. We'd look for a de-escalation with China and some progress with the EU. There’s a sort of “good cop (Treasury), bad cop (Commerce)” play going on and Treasury is up first. We'd also look for Canada to be included in the “just don't call it NAFTA” discussions. There seems to be some urgency going into the midterms to get something done. The big question is, how much is growth borrowed from the future? We'd say at least 0.5% but admit this is a very rough estimate and we’re not economists. Take a look at the second line. That’s GDI (Gross Domestic Income) and is an alternative way to measure GDP. They should be the same but there is a very big discrepancy right now. In the second quarter, investments in “Intellectual Property” were revised up by a whopping 2.8%. That’s basically software. But personal consumption and imports were revised down. The theory behind the tax cut is that companies’ lower tax bills lead to increased profits, which mean more investment, which grow employment and wages. The first one is happening. Pre-tax corporate profits were up 7% YOY and post-tax up 17% (these are national numbers…. S&P 500 companies are way ahead). Investment growth slowed and the personal side is back to where it was a year ago. So far the consensus is for another 3.5% GDP growth Q3 but the latest trade numbers were not great and are set to be a net drag in Q3. 3. Employment and the Fed: First Friday in the month so jobs numbers next week. We would expect around 180,000 but given the margin of error on this number, +/- 40,000 would not make much difference to the market. Hourly earnings will also be mostly unchanged at 2.5% but down and close to zero in real terms. The Fed doesn't meet until September 26, at which time they’ll almost certainly raise the Fed Funds rate by 25bp to 2.25%. Meanwhile, we’d expect 10-Year Treasuries to trade around 2.8% to 3.0%. 4. Stock market breadth: We've seen some improvement in the advance/decline ratio. What we look for is wide participation in the market. A “bad” participation day would be if a few stocks are enough to push the index up but the majority of stocks fall. Recently it’s been about half the stocks up and half down on an upday, which is good. 5. Emerging Markets. Markets bounced 4% this week, based on the Mexico trade deal and a weaker dollar. The big three influences are at work: trade, rates and the dollar. None of those will disappear overnight. But we’d look for some relief on the currency side. And on Emerging Markets…. Is the term “Emerging" accurate? Or are the so-called "emerging markets" comparable to the time-honored description of Argentina, i.e., "has a great future and always will have?" The Argentina reference comes from the fact that at the turn of the 20th century, Argentina was the world’s 10th largest economy. Now it's not even in the top 20. We don't think the term “Emerging” is terribly helpful. It was 40 years ago but when you have the second largest economy (China) and South Korea or Taiwan all called “Emerging” there is a definitional problem. Just to confuse things further, Argentina is Emerging with some index providers and “Frontier” for others. Same goes for South Korea. Some say “Developed,” others “Emerging” and the differences are down to the Chaebols, not to South Korea’s heft in the world economy. The “Emerging” definition these days is as much about governance as economic size. So countries with restrictions on foreign ownership, non-GAAP reporting standards, cross-holdings or voting shares are all in the Emerging bucket. When they start to address those they're promoted into Developed. There are some real powerhouses in emerging markets: China, South Korea, Taiwan and India. They're 65% of the index. And even eastern European countries (12%) are pretty advanced these days. So, yes, while “Emerging” has a nice ring to it, “Less developed” is probably more accurate. 7. And finally: In a month when we hit several all-time highs, we’d remind ourselves of the long term. Here’s the Dow Jones stock index back to 1900 (the S&P 500 is a better index but only goes back to the 1950s). Through some bad times, the market has powered ahead. On the 10th anniversary of the Lehman crash, it’s worth looking at how well the market has done over time. As always, if something comes up please feel free to call Rita on 415 435 8330. Bottom Line: Stocks are trending up but with no big stories or conviction but on macro and political headlines. A lot of action but not much change. The Days Ahead: Quieter week for big economic numbers. Watch for trade and updates on the Eurozone. One-Minute Summary. When markets crack, we know two things. One, the problems don't come from the last crisis (so no need to look in the MBS world). Two, they come from things you barely notice. Last week it was Argentina and Turkey. This week, it was Italy (see below). U.S. bonds promptly rallied 4.5% and the 10-Year Treasury yields, which many predicted would soar to 3% and beyond, fell to an intra-day low of 2.79%. Bonds got medieval on Tuesday and one Bond King had a very bad day. Domestic and international stocks and U.S. bonds finished more or less unchanged on the week. But there was plenty of action along the way. Small caps had another good week (they tend to not get riled by trade stuff) and are now some 500bps ahead of the large caps so far this year. The trade talk is not good. The U.S. went ahead with tariffs on steel from Canada, Mexico and the EU. We don't think they're going to take this one lying down. In past years, the parties would have taken the issues to the WTO and talked about it for a couple of years. This time Cecilia Malmstrom, the very accomplished EU Trade commissioner fired right back with, “When they say American (sic) first, we say Europe united.” So far markets have tended to view the trade talks as bluff followed by climb down. That’s worked. So far. Still, expect a lot more disconcerting headlines. 1. Markets are jumpy (Part 2): Here’s something you don't see very often. A G7 sovereign bond crashing in a single morning’s trade. As everyone knows by now, Italy is trying to form a government on a coalition of two parties. The Northern League (secession, pro-Russia, anti-GMO, lower taxes, Eurosceptic) and the 5-Star Movement (guaranteed minimum income, Green, unsure about immigration and mostly Eurosceptic) tried, failed and tried again to form a government. In Italy, winning parties must present their cabinet and government candidates to the President. He has veto power. And he used it. The fear then was another election in the fall with both parties running on an explicit “out-of-Euro” platform because…that’s the only thing these guys really agree on. Now we've seen Italian governments come and go and, with 42 Prime Ministers since 1945, a change of government in Italy passes as a Cabinet reshuffle elsewhere. And we don't really think this time is different. A government will form, it will make a few changes and it will argue with the EU about debt, growth and bond restructuring. That spike on the right is the spread between Italian (BTP) and German bonds (Bunds). Both Euro sovereigns. Both have never defaulted in 70 years. Both with rapidly improving current account surpluses. But the spreads “blew out” (technical term) from 120bp to 270bp which meant the price of an Italian bond dropped from €102 to €89. Stocks took a smaller hit and investors dumped Italian banks, who, of course, must hold BTPs for capital. Some of the big-name stocks were down some 25% from their late-April peak. By week’s end, things had settled down. The 5-Star and League parties will get their people in. The problems from the Berlusconi years (see famous Economist cover) will remain. Italy’s GDP per capita hasn't risen in 20 years. It seems unlikely a rancorous split from the EU will achieve much. And markets probably don't expect Italy to take it that far. We don't own foreign bonds and this week was a good reason why. You can lose much more of your principal on a spread-widening event than you can on rising rates. To us, fixed income allocations should reduce the risk of a portfolio, not increase it. But expect this to play for a while. The uninsured part of the labor force is the lowest it’s ever been. If you're not insured to receive benefits, you don't register for them. Wage inflation is barely moving in nominal terms and flat in real terms. Quit rates have not reached their pre-crisis level. You tend to quit a job if you're sure you can get another, so it's a confidence thing. The U-6 (underemployed) rate is nowhere near a 20-year low. Participation in key age cohorts is way down. To which, critics respond, well the labor market has changed, if you want a job you can get one and look this week’s Beige Book says St Louis is even hiring convicted felons. So, it's a tight labor market. Bottom Line: The Spain and Italy markets support our belief that U.S. Treasuries will remain well-bid and the 2-Year Treasury looks attractive above 2.5%. U.S. economic numbers last week were good but seemed more to be catching up with a run of less-than-great reports. Musk: public safety too important too important to abide by the government’s rules. One Minute Summary Low inflation numbers from both consumers and producers meant bonds rallied from the 3% level. We haven’t seen the 10-Year Treasury decisively break 3%. We don't put a lot of store in that number. It’s a nice round number but it’s not really relevant to the average Treasury buyer. We were pleased to see the bond market absorb a very large refunding week of $166bn in bills up to 30-year bonds. There are a few technical moves going on. Small Cap stocks had a good week. They’re up about 5% this year compared to the S&P 500 at 2%. The S&P 500 also managed to bounce off its 200-Day Moving Average. Emerging Markets tracked sideways. The combination of dollar strength, some highly indebted companies and Argentina and Turkey trying to salvage their currencies by ramping up short-term rates, sentiment took a hit. Turkey’s weighting in the Emerging Markets index is only 1.3% but it’s enough to give some concern. The biggest winner of the week were energy stocks, up around 4%. We think stocks are still trying to gauge where bonds are headed and where the next big catalyst will come from. We're not entirely sure ourselves except we’d say (stop us if you've heard this) growth is not particularly robust, inflation is low, the Fed’s going to raise rates slowly and all that can be undone with a single Tweet. We're still looking at protection and getting paid for some months of a sideways market. 1. What's going on in with inflation? Not much. The Fed thinks inflation is easing up hence the well-telegraphed three to four rate increases this year. We had a minor scare in January that Average Hourly Earnings (AHE) were rising too fast. But subsequent reports put paid to that notion and the January number was revised down. Inflation is probably the single most important driver of bond yields. Obviously, if you're paid a fixed coupon and fixed maturity, inflation eats into real returns. Equities, of course, are a very good inflation hedge until inflation gets out of hand and consumer demand flattens (the 1970s). Treasury Inflation Protection Bonds (TIPS) are also great hedges and we use them. But they don't provide much current income. Unemployment is low. Wage inflation must come soon. 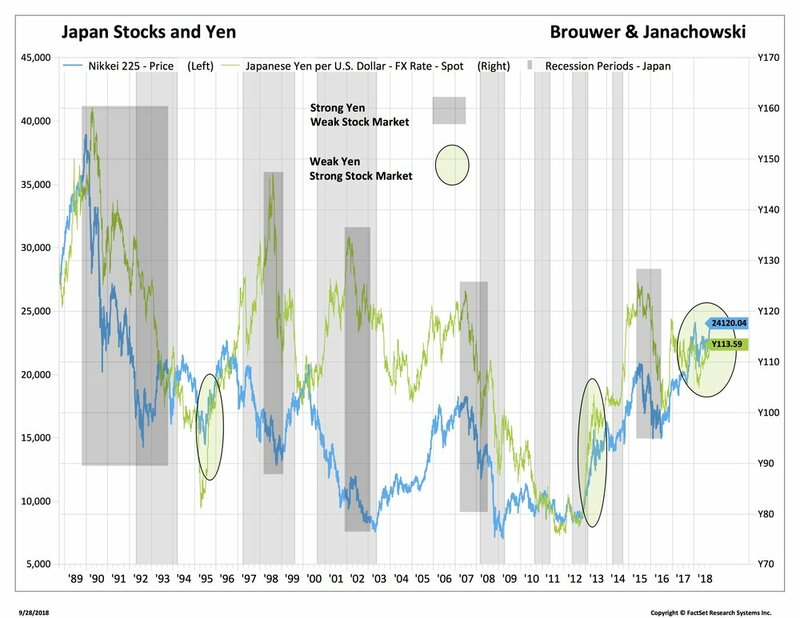 QE flooded the market with M2 money and there’s a decent and lagged connection with money supply and inflation. The twin trade and budget deficits will push up prices. 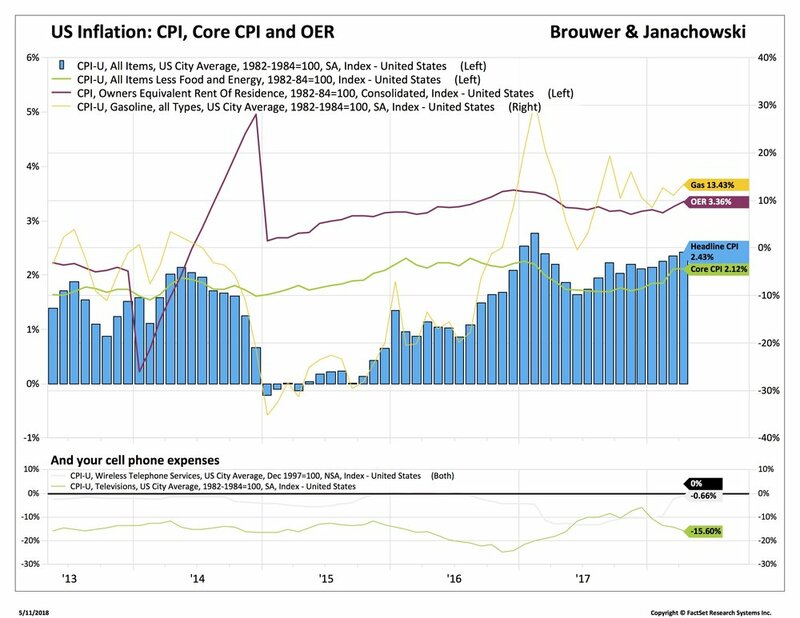 The core CPI (so take out Food and Energy) is up 2.1% and headline inflation is 2.4% with a lot of that driven by higher energy prices (up 13% to 20%) and the base effects of very low cell phone and medical expenses a year ago. We talk about this a lot but the story hasn't changed. What does this mean? We ran some very long inflation numbers here and would stick with our view that inflation will not take off and that the current 10-Year Treasury rate, which has flirted with 3% for a few weeks, will stay in a 2.8%-3.1% range for a while. The bond bull market may be over but there is no big uptick in yields coming. Now there are some pretty fierce arguments about the merits of each of these, especially the last one. In the “they're great, stop complaining” camp there’s Cliff Asness at AQR and in the “they kill prosperity” camp there are, well pick your number, but one of the more rational ones is William Lazonick at UMass. We'll not get into the merits because we're only really concerned about how the choices affect stock prices. And here, there is a clear winner: stock buybacks. Apple was the latest to announce a $100bn buyback and its stock rose 14% in a week. Not all share buybacks are received with the same enthusiasm. Some stock buybacks are basically self-liquidation exercises, with IBM being the most famous example. It spent $50bn of its $130bn market cap on buybacks and the stock fell 29%. Last week’s NFIB report was a cracker. Optimism increased, profits up and nearly 60% announced hiring plans. But recently those plans have not resulted in increased employment. Usually when that green line (good time to expand) goes up, employment growth follows soon after. But not in the last few years. In 2017, the “good times” line jumped very high but there’s been no follow through in bigger job numbers. What this means to us is that companies are keeping margins and profits as high as possible and are very reluctant to add to fixed expenses. The tax fix was meant to change all that but for now the benefits are mainly accruing to shareholders. Bottom Line: Eyes on the dollar. It has reversed in recent week and is now pretty much unchanged year to date. More strength will be bad for Emerging Markets and U.S. stocks. Bad news on the trade front will send it up. China is changing the way trade is shipped. When do one month bills yield more than three month bills? When your'e afraid you may not get paid back. Owners's Equivalent Rent (i.e. housing) at 3%.